Events in recent days have shown that despite the considerable advances of freedom and democracy, and even with the many safeguards of stability created in the decades since World War II, the European neighborhood can still be a very dangerous place. Before the Kremlin’s invasion of Crimea, the European Union, over-full from expansion and still bruised by the financial crisis, seemed to have lost its sense of direction and destiny. Likewise, an overstretched North Atlantic Treaty Organization (NATO), weary from more than a decade of engagement in Afghanistan, seemed unsure of its mission and future. With a single stroke, though, Vladimir Putin seems to have done what all the wise men in Brussels and Washington (and Ottawa) had struggled to achieve. He has unified the EU, catalyzed NATO and given years of new life to its Article 5 mission of deterring and defending against aggression. In many ways, he deserves our thanks for presenting such a gripping lesson on the perils of ignoring history. 1. Make it clear that the EU, NATO and other European organizations (e.g. Council of Europe, OSCE) stand resolutely for the rule of law and the rights of the individual. The rule of law includes, of course, the inviolability by outside parties of a nation’s territorial integrity. That means that Russian presence in Crimea must be withdrawn, that the Ukrainian authorities must be allowed to govern in their own country, according to its laws and constitution, and with respect for the rights of its citizens including the Russian-speaking population of Crimea. Organizations such as the OSCE can help ensure that those rights are protected. The first order of business, however, is the return of all Russian forces to the status quo ante, and the maintenance of law and order by the Ukrainian government. It is vitally important that EU and NATO nations’ leaders speak with a unified voice to make this clear, and keep doing so until that condition is met. Any other course will encourage both Putin and others to assume that the strategy of a quick, limited seizure of territory, followed by bluster and threats but no military action, is an effective and riskless form of aggression. 2. Make realistic economic and energy measures a formal part of the EU security, defense and foreign policy toolkit, and allow the responsible EU officials use them expeditiously when needed. As a consensus-based organization in foreign and security domain, with a large number of members, the EU is at a distinct disadvantage when referring to the Common Foreign and Security Policy. However, since it has elected to do so, it must do so effectively or it will rapidly lose credibility and influence. The spectacle of member state FMs contradicting each other or making unilateral statements about their contact with Russia in the current crisis severely undermines the Foreign Affairs Council and markedly weakens High Representative C. Ashton’s position. And when a country such as the UK stakes out a position that economic pressure to obtain concessions is fine, “as long as it doesn’t discomfit the City,” you can be sure that no such concessions will be forthcoming. Decide if HR Ashton is really responsible for implementing EU foreign policy or not. If she is, let her do it. 3. Put the concept of an expanded EU defense force on hold, and return to NATO planning to develop strategies and determine necessary resources for the defense of Europe and its periphery. It is time to end the fiction that Europe has sufficient resources to both meet its NATO force generation obligations and to field a second defense establishment, fundamentally EU in character, with separate mechanisms for determining threats to security, developing strategies and plans to react militarily, training, exercising command and control through a dedicated communications system and procuring platforms to deploy those forces where needed. Europe has demonstrated that it is unwilling or unable even to meet the recommended 2 percent defense budgetary outlay recommended for all NATO members, let alone create and maintain a separate force. This is not to say that there will never be a time for the EU to lead a military or quasi-military mission. The recent French-led mission to Mali is an example of where that can succeed, in the absence of a compelling NATO interest, and the Berlin-plus mechanism can be used to support such missions. However, duplication of requirements only further taxes already overstressed planning staffs, and uncertainty about which scenarios to exercise or which command channel to use weakens the readiness of both EU member state militaries and NATO as a whole. 4. Reinvigorate NATO Article 5 planning and exercises; increase national budgets, where necessary, to ensure force generation requirements are met. If nothing else, events in Crimea drive home the fact that the danger of military misadventure in Europe still exists. We would all like to think that Europe is a safe, tranquil zone, which has overcome the dangers of nationalism and greed, but past events in the Balkans, Moldova, Georgia, Ukraine and elsewhere refute that belief. Europe is surely safer than it was during the Cold War, but so long as force can be used to change national boundaries there remains a need for mutual defense. Article 5 planning has been neglected, particularly since deployment of NATO forces to Afghanistan, and urgently needs to be addressed. After potential threats are identified and plans to counter them are drafted, NATO forces need to exercise for that possibility. Unfortunately, NATO member militaries have atrophied in recent years, as budgets reflected political leaders’ judgments that military force was an anachronism. 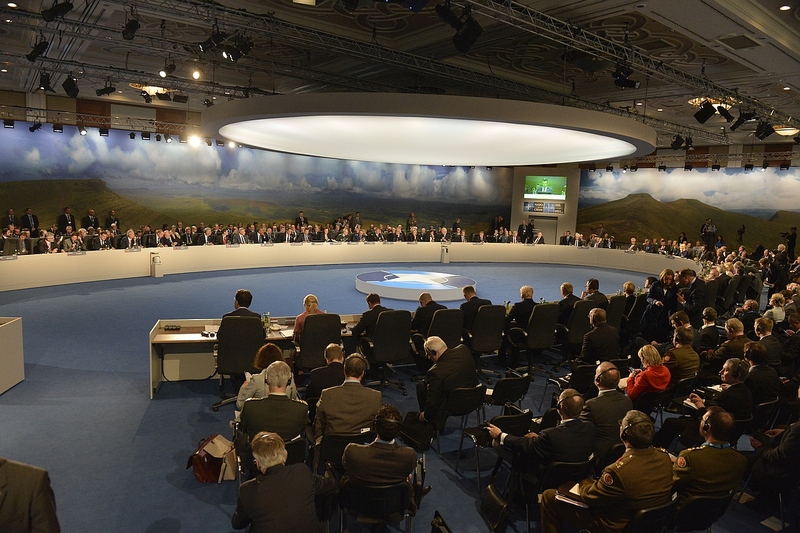 At a 2006 summit, NATO’s members agreed to spend 2 percent or more of their GDP on defense. In 2012 only four members, the United States, Great Britain, Greece, and Estonia, met this standard. An even more surprising statistic may be this: During the Cold War, the U.S. accounted for about 50 percent of defense spending in NATO. In 2013, the U.S. portion was over 75 percent. If the EU is serious about preserving security on its borders, this must change and European militaries must be more than a policy afterthought. 5. Complete and ratify the Trans-Atlantic Trade and Investment Partnership (TTIP) between the U.S. and EU. In and of itself, TTIP has enormous potential, in that it would integrate the world’s largest market, the EU, and the single largest economy, the United States. It will harmonize product regulation, reduce the bureaucracy required to export or import products and promote increased transparency, potentially saving business and consumers billions of dollars or euros. It is also a potential magnet to eastern European countries that have not yet entered agreements with the EU on economic and political cooperation. Through access to this kind of expanded and efficient market, business in potential EU-associate countries stand to substantially increase their revenues, and governments their tax base. This gives a powerful lever to the EU to use to obtain reform of government structures, increased transparency and commitment to the rule of law and human rights in those countries. 6. Offer meaningful support to countries on Europe’s borders trying to transition to representative democracies with free market economies. The EU’s current proposed 14 billion euro (and U.S. 1 billion dollar) package of assistance to Ukraine is an excellent step forward. It might have been of greater value, however, had it been offered prior to the V. Yanukovych government’s November 2013 decision to terminate negotiations with the EU on an association agreement. There are, of course, arguments on both sides. However, it will generally be better to provide such assistance with linkages to assurance of reforms prior to the country entering an in extremis situation. Revolutions, even relatively peaceful ones, are often bloody and unpredictable, with unforeseen consequences (such as invasions by third parties) always waiting in the wings. 7. Continue or accelerate deployment of an anti-missile defense system in Europe. Against our best hopes, the Putin regime has clearly demonstrated that we are not yet living in a world, even in Europe, where nations will refrain from using their militaries in an offense manner to achieve their objectives. Therefore, it is important to take realistic steps to counter the potential effectiveness of those military forces, so that they will either be deterred from an attack, or the resulting amount of death, injury and destruction can be limited. While the primary purpose of a European missile defense system was and is to protect Europe countries against the limited ballistic missile capabilities of a rogue regime, its additional utility against a now clearly adventurist Kremlin would be welcome. The installations themselves also would have the benefit of visibly showing NATO and the EU’s commitment to defend Europe’s citizens. The fall of communism in 1989, with the unification of Germany and the new freedom for former Warsaw Pact nations to choose their own destinies set Europe on the road to being whole and free. The “big bang” EU enlargement of 2004 and the welcoming of the citizens of those countries into the European community was another giant step down that road. Now, there is a new sense of urgency and unity as the result of an obvious, baseless and illegal invasion of Ukraine by Vladimir Putin’s anonymous troops. Perhaps, ironically, this provides a chance for Europe to move down the road again, by extending its hand, and its human and economic freedoms to its eastern neighbors.